On a cold winter’s day we all need a pick-me-up. I found this one today, on Sydney’s Kitchen blog. It is perfect, even if you have to resort to thawing frozen fruit or extracting fruit spoonfuls from a glass jar….take heart, spring is only a couple months away! Spray 36 mini muffin tins, set aside. Preheat your oven to 325 F.
In the bowl of your electric mixer beat the butter until light and fluffy. Add the sugar and stir slowly until combined (so that it doesn’t fly everywhere); once combined, beat it until smooth. Beat in the vanilla, scraping down the sides of the bowl. Add the flour and cornstarch in the same manner you did with the sugar. Beat the mixture until everything is incorporated. 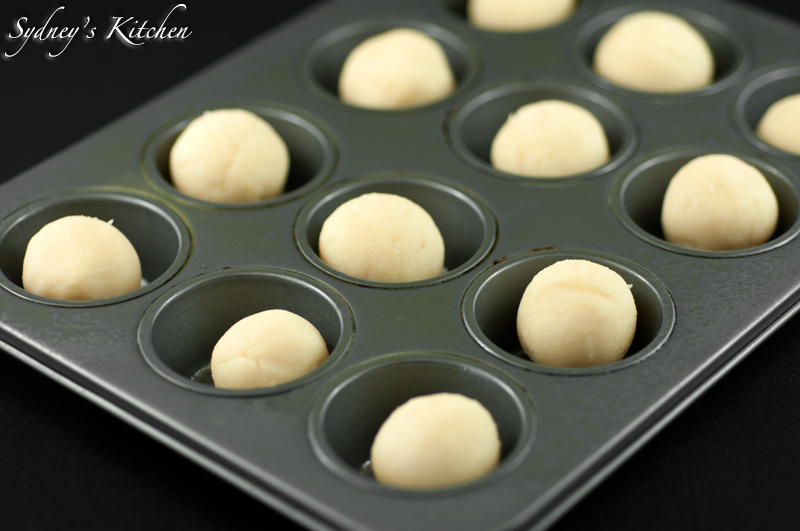 Divide the shortbread into 36 even balls and then place them into the mini muffin tin and gently press the dough up the sides of the tin to form a shell. Once all of the muffin tins are completed with the shortbread shells, place the mini muffin tins into the freezer for about 15-20 so that the shortbread will be firm. (It will also help keep the shortbread from puffing up during the baking). Bake for 15-20 minutes or until lightly browned. Turn the tins half way through the baking to ensure even cooking, when you turn the tins poke the bottoms of the shortbread with a fork if they have puffed up. Once they are fully cooked remove them from the oven and cool completely on a wire rack. In the bowl of your electric mixer beat the cream cheese or goat cheese and sour cream until smooth. 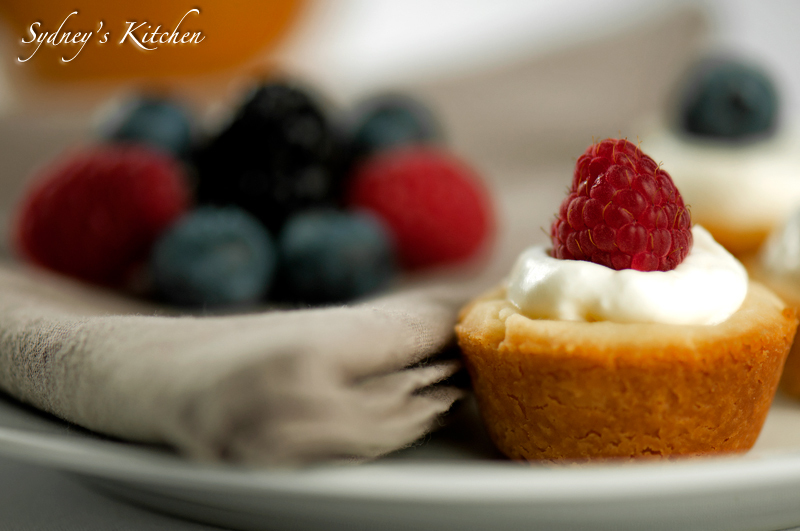 Add the whipping cream, vanilla and sugar and beat until soft peaks form. Shortbread is such a delightful dessert. This recipe proves that shortbread is not only for the Christmas season, you can serve it year round! It is so delicious. This recipe can easily be doubled, tripled and so on because they do freeze well, which is perfect if you want some saved for a later date. Doesn't this look moist and chewy and luscious? Place a piece of aluminum foil into a 13×9×2-inch pan, allowing the sides to hang out on the long side. Set aside. Baker’s note: You can use an 11×7×2-inch pan to produce a thicker blondie. In a mixing bowl, stir together the first three ingredients. Add the next five ingredients (using only the ½ tablespoon of zest) and beat with a handheld mixer until well blended. Add the yellow food coloring (if using) and incorporate into the batter. Stir in the nuts and chocolate chips. Pour batter into the prepared pan and evenly smooth the top with an offset spatula. Bake for 25-30 minutes, or until light golden brown and set. Baker’s note: If using the smaller pan, you’ll need to adjust the baking time. May take up to 20 minutes more before the center finally sets. Cover the top with foil if it begins to brown too quickly. Use a wooden skewer to test for doneness and allow for some moist crumbs to be clinging to the skewer. As long as the center isn’t liquidy or pasty–thick in consistency, it’s okay for something crumb-like to be sticking to the skewer. While blondies are baking, prepare the glaze by combining powdered sugar with the lemon juice and the remaining 2 teaspoons of zest. Set aside. Once the blondies are done baking, remove from oven and pierce entire top with a fork or blunt end of a skewer (while blondies are still hot). Quickly pour glaze over top and smooth to the edges of pan (it will soak in). Allow the glazed blondies to completely cool in the pan. Once cooled, cut into squares or rectangles. Thanks to Wine Imbiber for the splendid pix and recipe! Sweet or Savory Cookies – Take Your Pick! You can fill these beauties with Nutella, with chocolate chips, different jams and maybe even chestnut paste. Having no sugar in it, the dough is also destined for savory applications to, be it herbed goat cheese, a nugget of firm cheese, or a slip of caramelized onions. Cream butter in a large bowl with an electric mixer until smooth. Force cheese through a sieve right onto creamed butter and stir it in. Add the sour cream and vanilla and combine the mixture well. Whisk or sift together flour and salt in a separate bowl and gradually blend it into the cheese mixture. Wrap the dough in plastic and chill it for at least 3 hours. Preheat oven to 400°F. Roll one-fourth of the dough out very thinly on a lightly floured surface and chill the remaining dough until it is to be used. Cut the dough into 3-inch squares** and put about 1/2 teaspoon jam or preserves in the center of each. Fold the dough in half on the diagonal, pressing firmly down to seal the two sides around the jam. Roll the triangle into crescents, starting at the wide end. Arrange crescents on a baking sheet (they won’t expand terribly much, so just an inch or so between them is fine), brush them lightly with milk and bake them for 15 to 20 minutes, until they are golden. Transfer the cookies to a wire rack and dust them with powdered sugar. Continue making cookies in the same manner until all the dough is used. Now don’t these look divine? Flaky, slightly sweet, jammy and tender...my favorites! Thanks to Smitten Kitchen for the recipe and photo.